Sauce for Sugar-Counters, Soda Innovations, Holiday Fun & MORE! 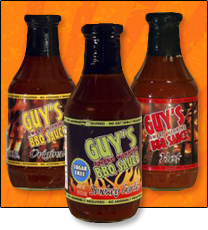 Guy's Award Winning BBQ Sauce - There are a lot of BBQ sauces in the world, but this Guy makes tasty sauces in regular and sugar-free varieties! Both lines feature Original, Hot, and Spicy flavors; there's also a Smokey Garlic option (our fave!) in the sugar-free lineup. A 2-tbsp. serving of sans-sugar sauce has just 5 fat-free calories, 115 - 140mg sodium, and 1g carbs (PointsPlus® value 0*). The regular versions have only 45 calories, 0g fat, 180mg sodium, 12g carbs, and 7g sugars (PointsPlus® value 1*) per 2-tbsp. serving. FYI, the Hot is hotter than the Spicy is spicy. Get it? Good. Click for stores or order online! Amy's Gluten Free Wraps - Joining our gal Amy's gluten-free burritos are these frozen wrapped items without gluten! The Teriyaki and Indian Aloo Mattar wraps each have 250 - 270 calories, 6 - 9g fat, 540 - 590mg sodium, 32 - 38g carbs, 3 - 6g fiber, 5 - 7g sugars, and 9g protein (PointsPlus® value 6*). There's also a Tofu Scramble Breakfast wrap, but that has slightly higher stats. Find these things in the freezer aisle STAT! Soda News: Sip On It! Get excited, soda lovers! Remember the Coca-Cola Freestyle fountain we buzzed about a while ago? It's a super-cool machine that lets you custom blend your beverage from 100+ choices. Well, Burger King is adding the high-tech contraptions to locations across the country! Just stick to the low-calorie options (of which there are MANY), and click here for a refresher on what guilt-free fast food to order. And on the heels of the successful Dr Pepper Ten, Dr Pepper Snapple Group is reportedly preparing to roll out many more sodas with ten calories per serving -- Sunkist Ten, 7 Up Ten, A&W Ten, RC Ten, and Canada Dry Ten will debut in test markets beginning this January. However, the no-girls-allowed ad campaign will remain exclusive to Dr Pepper Ten -- GOOD! If you're exercising and eating right but not shedding any pounds, chin up: A few studies have made really compelling cases for why you should stick with the smart habits. One study found a link between improved fitness level and prolonged life, regardless of any weight change. Results of another study suggest that exercise alone could curb overeating by stimulating the brain. (Science is cool!) And in a third study, obese patients with diabetes showed improved heart function upon following a calorie-restricted diet. See, it's worth it! And, at the risk of sounding like Tony Robbins or a L'Oréal ad, you're worth it. Cupcake Accessories, Candles & Veggie Crops! Get your domestic goddess on -- check out these fun finds for when you have people over... or when you're just chilling in your abode! Meri Meri Holiday Cupcake Decorating Kits - Here's a way to add seasonal fun to HG cupcakes... guilt-free! Cute cupcake liners and decorative (not edible) toppers in gingerbread and Nutcracker themes will impress everyone. Who needs frosted cookies? Aunt Sadie's Holiday Candy Cane Candle - The tin is sleek and festive, and the candle smells like peppermint candy. If you wanna make your home smell like a party, light up this long-burning candle and let the fun begin! 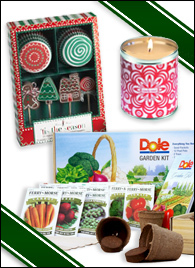 Dole Garden Kit - With this super-simple starter kit, even novice gardeners can start to grow their own veggies! OK, so maybe you won't be able to dazzle your friends and family with your homegrown goodies this holiday season. But you can use the veggies in next year's holiday recipes. Yay! Looking for brain food? 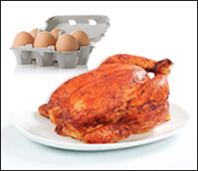 Try chicken or eggs! Both contain sizable amounts of the nutrient choline, and a recent study found a link between a higher choline intake and better cognitive performance. We'll definitely start adding more chicken and eggs to our diet... but which comes first? (Tee hee!) ***Want a new recipe? SHAZAM! When you use the Shazam smartphone app during an upcoming Pillsbury Crescents commercial, you can instantly access the recipe for the food being made in the ad. WHOA! Think of all the cool uses for this... for example, during cooking shows like Hungry Girl! ***Are you stressing out this holiday season? According to a recent Consumer Reports survey, crowds and long lines are the number-one thing people are dreading this time of year; gaining weight takes the number-two spot. In tenth place? Having to be nice. Oh come on, grinches... ***If you like to color-coordinate your foods and plates, maybe it's time to stop being so matchy-matchy. New data published in the Journal of Consumer Research suggests that people tend to over-serve themselves when their food is the same color as their plate. When subjects were asked to serve themselves white-sauced pasta on a white plate, the portions were generally larger than when prompted to serve the same stuff on a red plate. We're gonna go buy some blue plates -- hardly any foods are blue! ***Did you catch the "Holiday" episode of Hungry Girl? If not, never fear! The episode re-airs on Food Network this Sunday (12/18) at 10am/9c! Tune in as Lisa whips up delicious seasonal treats with the help of a special guest... SANTA! And that's all we've got. HG out! Keep that seasonal spirit coursing through your veins -- click "Send to a Friend" to share this week's fun goodies! Happy Gingerbread House Day, December 12th! We'll be celebrating with some of HG's Thin-gerbread Men instead of edible homesteads... because we're rebels like that.